How Can I Integrate My Smartphone Into My Car On The Cheap? I'd like to integrate my smartphone into my car, but it's a pretty basic vehicle that's a far cry from technologically advanced. What can I do without paying a fortune to make my car and smartphone work well together? I know how you feel. 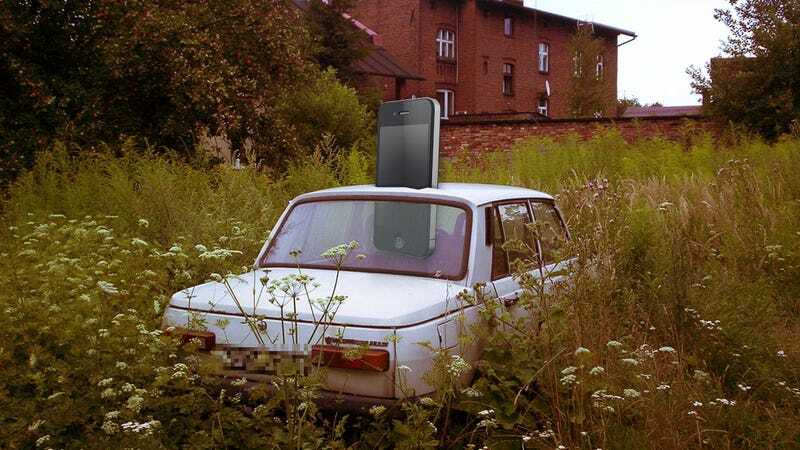 My previous car had practically nothing in the way of technology. It was as basic as you could get. I didn't even have an auxiliary port to hook up my smartphone and play music through its terrible speakers. I've since upgraded to that option, but for three years I had to find a number of alternatives. Nothing is going to be as good as an integrated system, but there's a lot you can do to make your smartphone work better with your vehicle. Let's look at your options, step by step. The good news is that you'll be hard-pressed to find a vehicle that doesn't offer a power port that can be adapted for USB charging and is lacking space for you to mount your phone. All you really need is a cheap USB adapter and a charging cable for your device to get started. That's enough to at least power your phone, but to keep it from floating around in the vehicle, you'll need to mount it. While there are plenty of options you can buy, we've found that the one you can make out of office supplies is actually the best. Most of us at Lifehacker have made this mount ourselves and use it regularly. I've been using mine for over a year now and it's still going strong. It takes about 20 minutes to create, and it mounts to your car in any location that can accommodate a binder clip. For some that means the vent of an air conditioner, but I don't like that option because it means a USB cable is going to be swinging around. Instead, I've mounted mine to the side of the cup holders. This may not be an option for everyone, but experiment with the spaces you've got and you're likely to find something that works. Once you've got everything in place, be sure to keep it organized. If your car does have an auxiliary port and you're happy with the quality of its sound system, all you have to do to hook up your smartphone and you're good to go. If you don't have an auxiliary port, you have a few other options that will require some sacrifices or a bit of work. First, the simplest solution is purchasing an FM transmitter, which will weakly broadcast your smartphone's audio signal as an FM radio station. The problem is that these devices don't provide the best audio quality and often suffer from interference from various radio stations. One solution to this problem is removing your car's antenna so it doesn't actually pick up any other stations and cause issues. This isn't ideal, but if you don't listen to the radio (or your smartphone has its own tuner) it won't cause much of a problem for you. If that's not going to work, you can use the SIRIUS Frequency Finder to try and discover a transmission frequency that will work without much interference. Second, you can install computer speakers and use those instead. Chances are your audio will be a bit better and the hack won't cost you too much. Finally, you can hack your car to add an auxiliary input. Being able to just plug in your smartphone is the ideal solution, so if you can handle a moderately complex DIY project you can upgrade your car on the cheap. Using your smartphone in your car often means taking your attention off the road. While you're always going to be a little distracted no matter how you're interacting with the device, if you don't have to look at it your eyes will at least be where they ought to be. Voice control is currently the best available solution, and there are plenty of options even if your phone doesn't offer one out of the box. Most Android users have good built-in voice control, and those with Android 4.1 have an even better solution. That said, if you're on Android and looking for something more assistant-like (such as what you'd find with iOS' Siri), there are plenty of apps for the job. iPhone users without Siri will want to check out an app called Vokul, which is voice control designed to for use in the car. If you do have Siri but want to control it hands-free, there's a jailbreak hack that can help you out. Regardless of how much work you have to do to integrate your smartphone into your car, the important thing is that you consider how to use it safely when you're driving. It's great to be able to use your phone's conveniences during your commute, but only so long as you're keeping yourself (and others) out of harm's way.